This paper focuses on one aspect of the social impact of the arts: their in? uence on civic engagement. 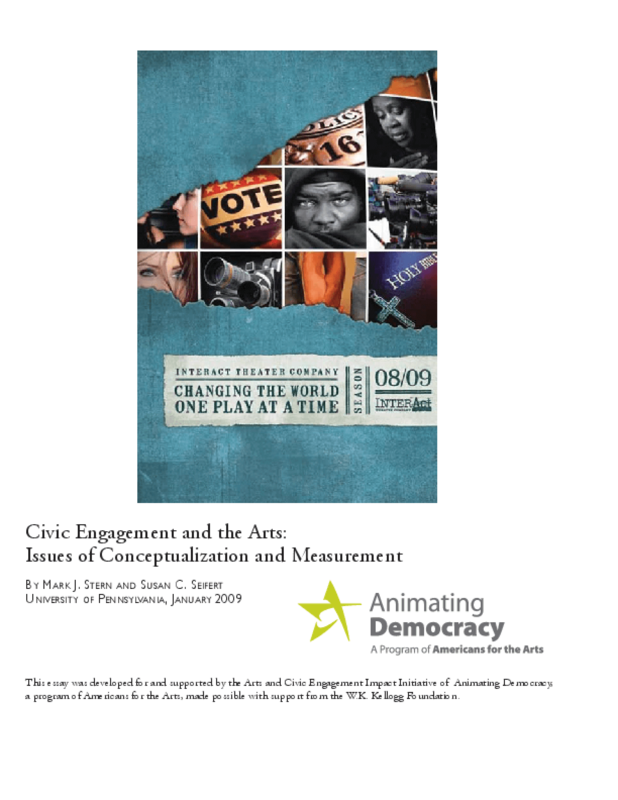 Its purpose is to assess the current state of knowledge about the relationship between the arts and civic engagement and to suggest documentation and evaluation strategies that artists, cultural and community organizations, philanthropists, and public agencies could take to improve the quality of that knowledge. Our approach was to review literature drawn from the social sciences, the humanities, and public policy in an attempt to bridge theory with practice and research with evaluation. Copyright 2009 Arts and Civic Engagement Impact Initiative of Americans for the Arts.